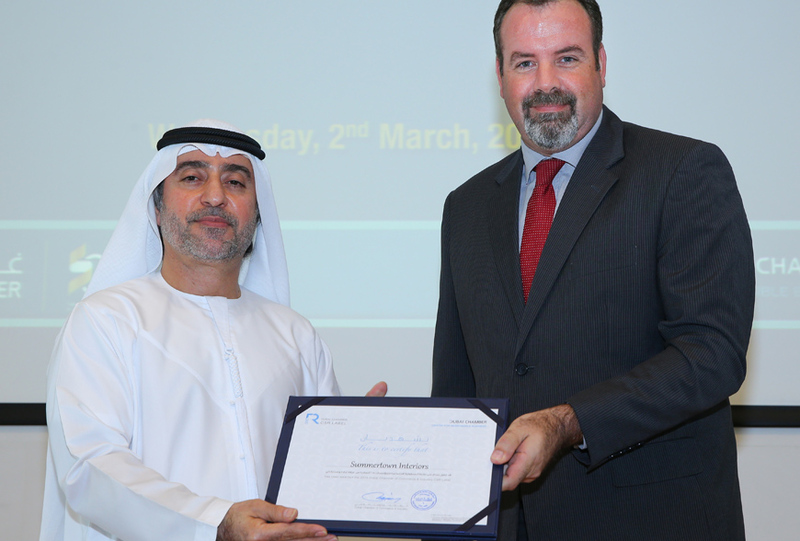 Summertown Interiors has received the Dubai Chamber of Commerce CSR label for the fourth consecutive year. The accolade was presented at an awards ceremony on March 2nd to Summertown’s Project Director, Paul Briers, in recognition of Summertown’s continued efforts to promote sustainability and ongoing business improvements to embed CSR into its business practices. “Summertown Interiors is very proud as an SME to receive this award alongside major international companies who are deemed real leaders in the field of sustainability. We have come a long way since we embarked on our journey and we’re immensely proud of our achievements” says Briers. Summertown were recognised for their ongoing commitment to sustainable business practice over the 4 key pillars of the framework – workplace, marketplace, community and environment. Particular reference was given to Summertown’s efforts towards its goal of achieving carbon neutrality by 2020 and conducting the recent activities to target LEED Ebom certification for its facility in Jebel Ali.